The archaeological research in the northernmost part of Namibia has not been very elaborate so far. Nevertheless this area has had great influence on the discussions about the later prehistoric settlements in the entire South African region. This especially concerns in the eastern part (Kavango region) of northern Namibia the routes of the so-called „Bantu migrations“ and the spread of horticulture and iron technology and in the western part (Kaokoveld) the introduction of domesticated animals and pottery. The area offers an ideal regional focus, because it comprises different ecological settings for respective studies, as it ranges between the Atlantic and the Zambesi, and from desert to savannah and woodland conditions. Thus a primary aim of the project is to arrange several smaller study areas along a west-east transect in order to investigate strategies of adaptation and innovation under different environmental conditions. In the first phase of the project this demands long-range survey activities (including test excavations) that are carried out in close cooperation with botanists and geographers. Only after this, and after checking the archaeological potential and the state of preservation of organic materials (bones and botanical remains) more detailed archaeological studies can be carried out. Besides focusing on environmental and economical aspects and the modes of human adaptation, the project aims to contribute to a better chronological framework covering the last 3.000 years of human and environmental history in this area. Unfortunately it is extremely difficult to find well preserved prehistoric open air sites - the most likely settlement type related to pastoral nomads - in the Kaokoveld. Up to now the most significant results are provided by excavations in a rock shelter, named Oruwanje 95/1. The archaeological material from Oruwanje 95/1 enables the drawing up of a reference stratigraphy with important evidence for the appearance of pottery, sheep and goat at least since 2000 bp in this region. The excavated material from another rock shelter (Epupa 96/1) is not analysed yet, but the sequence seems to cover subrecent to Early Holocene material. Another site (99/1) is the only rock shelter with rock paintings in the Kaokoland. 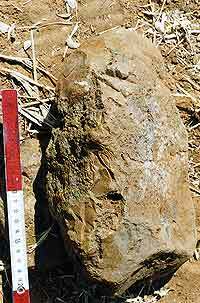 In addition the basal layer seem to contain MSA stone artefacts. If the preliminary assessment is confirmed by further analyses, the site 99/1 is the first stratigraphy in the Kaokoveld reaching back to the Pleistocene period. Recent survey activities and small excavations have yielded 73 archaeological sites along the southern banks of Kavango River/Namibia (M. Albrecht/R. Kuper/J. Richter) (Fig. 1). Surface collections and small test trenches has produced prehistoric artefacts, information on stratigraphy and radiocarbon dates, taken together these have helped to establish a preliminary cultural sequence from the Early Stone Age to the Late Iron Age. Ceramic LSA assemblages from the 2nd/1st millennium BC are among the earliest occurrences of pottery in southern Africa. The Iron Age, beginning prior to 1000 AD can be divided into an earlier and a later stage which is represented by remnants of melting stoves, settlements and abundant artefacts. Flakes and cores, possibly attributable to a kind of ‘Developed Oldowan’ Industry, give us a hint of what the earliest occupation of this area by Homo erectus, more than 1 mio. years ago was like. Acheulian hand axes, flakes and cores of the ‘Victoria West’ method of artefact production attest to a later stage in the Early Stone Age occupation, ca. 500.000-200.000 years ago (Fig. 2). Blades and flakes of the characteristic "Levallois" method of artefact production have been found on a few Middle Stone Age sites. The Pleistocene/Holocene boundary saw microlithic industries of the Messum-Menongue Complex dating to around BC 10.000. Within this period, these characteristically small tools occur along with bifacially worked leaf-shaped points. Generally spoken, microlithic industries are attributed to the so called Later Stone Age, the Messum-Menongue Complex being an early stage of that (Fig. 3). The private collection of the late Rev. Hartmann of the Shambyu missionary station comprises several thousands of microlithic artefacts from our research area, information on their origin is lacking however. By contrast, and most surprisingly, evidence from our fieldwork for early and mid-Holocene occupation of the area has remained very poor. Nevertheless, the Later Stone Age can be divided into an earlier pre-ceramic stage and a later period associated with an early pottery (CLSA). The latter is well represented by a group of sites west of Rundu. Abundant microlithic projectile points within these assemblages provide a good argument for hunting as an important economic component of the CLSA. Recent fieldwork has focused on one of these sites near Kapako. There, the CLSA is connected to an early iron smithing location. Two initial radiocarbon dates taken from charcoal samples in deeper layers give a time span from the beginning of the first millennium BC and 600 AD for this site. The pottery shows strong affinities to Early Iron Age sites in western Botswana. As the Kavango region seems to have a key function in the introduction of pottery and early herding in southwest Africa, this exceptional association of classical Late Stone Age artefacts with pottery, tuyères and slag fragments could contribute to the question of the position of hunter-/gatherer- societies in the development of the Iron Age in southern Africa. Most of the archaeological sites recovered in the Kavango region can be attributed to the Iron Age. An earlier stage of that was already attested by the Namibian archaeologist B. Sandelowsky starting at the end of the first millennium AD, but very little more than that is known so far. In the 16th century AD, the well recorded migration of the recent Kavango peoples coming from the north-west introduced a Later Iron Age culture. According to oral traditions they lived on hunting and were attracted by the natural richness of the countryside. They were active iron smelters and smiths along the riverside until the beginning of the 20th century. Large areas of iron ore exploitation from ferricrete layers close to the river banks, as well as centres of iron production and iron working have been recovered (Fig. 4 / Fig. 5 / Fig. 6 / Fig. 7).